Six large indian nations are to be found in Tocantins: the Karaja, the Apinajé, the Krahô, the Xerente, the Xambiao and the Javae. Their customs still survive on the reservations. Touristic tip: As far as we know there is not yet a touristic program to visit the reservations. Officials have explained us that it is better to be accompanied by a guide. Better for the indians and better for the tourist. Indian art can be bought at any Casa do Artesanato throughout the state. On the map you will find the main locations of indian reservations in the state of Tocantins. Click to enlarge. These belong to the non-classified linguistic group of the Marco-Je who are divided into the Karaja, the Javae and the Xambioa. They call themselves people of the Iny and possess customs and dialects in common. 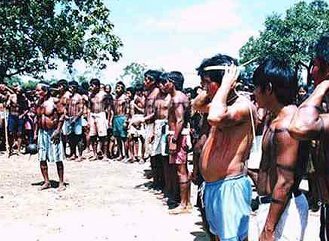 The Araguaia Reservation is 4000 acres, inhabited by 2900 indians. The Karaja, the Javae and the Avacanoiro live primarily of fishing and hunting and cultivate small plots. Xambioá villages: Xambioá and Kurerê. These also belong to the Macro-Je linguistic group and are part of the Timbira group, along with the Kraho and the Xerente. The Timbira are especially noted for their circular villages and the circles of tree-trunks around them. They have a rich and distinctive culture, still upheld by most of their members. They ara found around Tocantinópolis, Maurilândia and Cachoeirinha in the far north, and their numbers are growing. At present they number 900. 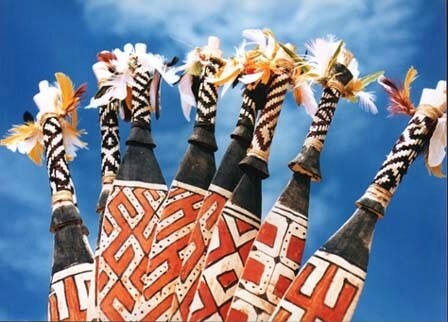 The Apinajé reservation cover 350,000 acres and their basic economy revolves around the babucu-palm nut, subsistence agriculture and handicrafts. Apinajé villages: São José, Mariazinha, Butica, Riachinho, Cocalinho and Bonito. 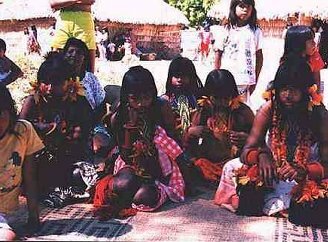 They also belong to the Timbira group and originally lived around Carolina, in the State of Maranhao, driven out by wars over land ownership, they gave rise to the Xerente, the Xavante, the Kraho, the Apinage and others. The Xerente are found in the center of the state and their reservation is located in the municipality of Tocantinia. They are 1,500, divided into 29 villages over an area of 459,000 acres. Their customs are well preserved. Body painting is commonplace and dancing, often carrying tree-trunks is still practiced. They engage mostly in substance agriculture, handcrafts and hunting, although their customary prey is now in short supply. Xerente villages: Funil, Bela Vista, Cercadinha, Brejo Comprido, Serrinha I e II, Centro, Agua Fria, Rio do Sono, Mirasol, Recanta, Baixa Funda, Brejinha, Salto, Porteira, Aldeia Nava, Sangradouro, Lajeadinho, Cabeceira, Morrinho, Recanto da Agua Fria, Novo Horizonte, ZéBrito, Aldeinha, Rio Preto, Bom Jardim, Paraío, Baixão, Traíra, Ponte, Mirasol Nova. They speak Timbira in the Krahô dialect. Such languages are spoken from the north (Maranhao and Para) and central Brazil (Goias and Mato Grosso) to the south and south-east (Sao Paulo, Parana, Santa Catarina and Rio Grande do Sul) and are subdivided into Tombira, Caipo, Akwen and Kaingang. The Krahô Reservation is situated in the municipalities of Goiatins and Itacajá, in the northeast. About 2,500 members are distributed among 13 villages in an area of 750,000 acres. The reservation possesses quite remarkable beauty spots in an ecosystem typical of the arid Brazilian central plateau characterized by mountains, networks of caves and cascades. Agriculture is the nations mainstay, along with hunting and fishing. The Krahô are notable for their zeal in preserving the customs. Their main festivals are Wakamye Katamye (the potato festival) and the winter/summer festivals during which new village chiefs are chosen. Krahô villages: Rio Vermelho, Manoel Alves Pequeno, Cachoeira, Pedra Branca, Macaúba, Pedra Furada, Campos Lindos, Agua Branca, Riozinho, São Vidal, Morro do Boi, Serra Grande, Forno Velho, Santa Cruz and Lagoinha. The Karaja and Guarani live along the banks of the Araguaia on the border with Para, in the municipality of Santa Fé do Araguia. There are 280 in two villages. They live by fishing, even on a commercial scale and subsistence agriculture. Their reservation covers 8,200 acres. 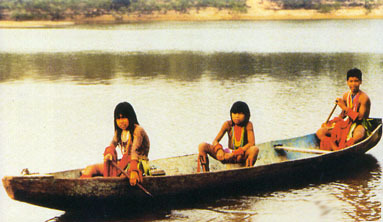 About 700 Javaé indians live in the Parque Nacional do Araguia. 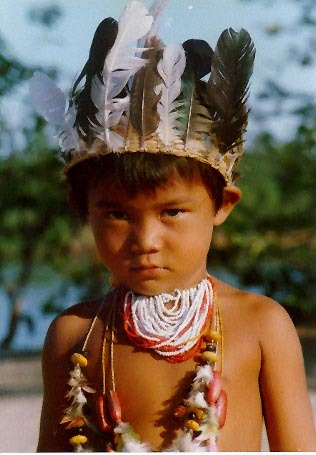 Less than 100 Boto Velho indians live in the area of the Lagoa da Confusão. About 250 Funil indians live near the village Tocantinia.